123 Deficit Pushups! I am tired! Hello Hello, Welcome back to hopefully your regularly scheduled programming of I DRANK THE CROSSFIT KOOLAID Blog. hehehe. I hope I’m not MIA for a week again anytime soon with the exception of vacations or whatever 🙂 I say VACATIONS (plural) as if that ever happens! 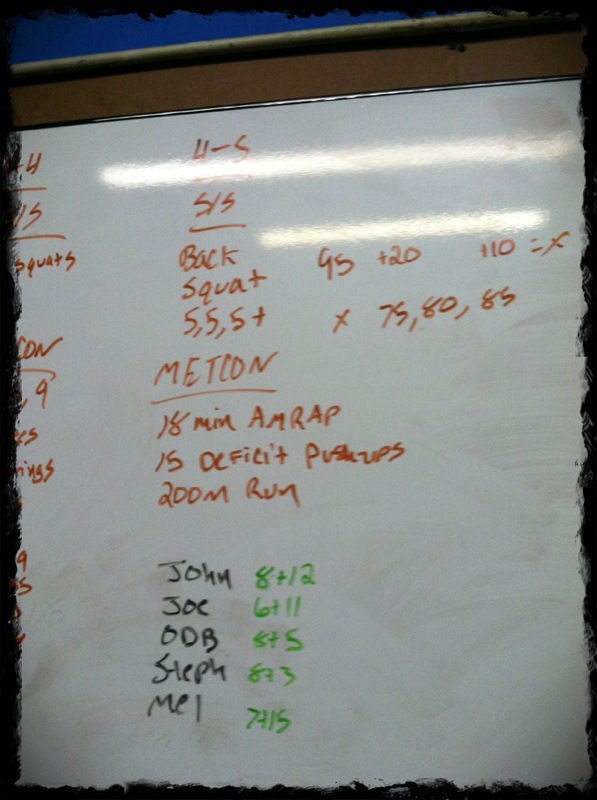 Today’s WOD was a long killer AMRAP. 18 minutes of 15 Deficit Pushups and a 200m run. EIGHTEEN MINUTES! Argh!!! PushUPs! Double Argh!!! I was struggling after about 3 rounds. Thank goodness for the RUN! Hahhaha, YES I was grateful for the running. My arms didn’t know what to do cause they were dying but they didn’t have to carry me for 200m so it was A-OK! It was about round 5 where I was catching up to a couple of the guys. Coach was like “SOMEBODY BETTER PULL AHEAD on this run”. I was told during the run he was talking to me! Hehehe, so I did pull ahead for a hot minute but I did not keep the lead when it came back down to pushups. I kept trying to do 5 pushups at a time, which worked till rounds 7 and 8. Final Count 8 rounds 3 pushups for a total of 123 Pushups and 1 mile of running… wooooooo. I don’t know how I stood up against the rest of the day. Tomorrow the whiteboard will tell. I hope I’m at least mid to upper pack. It was not easy! Our Skill Strength was Back Squats. 5, 5, 5+ My hip was killing me and the weight felt SUPER heavy today. I only got 3 on my 5+. That’s not supposed to happen but it did. I bottomed out. 😦 Poor Poor Petri I know. Ah well. Also, last night I prepped some Lamb Riblets … HOPEFULLY they will come out good tonight. They’ve been marinating all night and all day today. I’ll let you know. I failed to take pics of me prepping the food but hopefully I’ll have a good finished meal shot! Wish me luck. Hope everyone has been enjoying their day. See ya.